Over the last year or so I’ve been making Kombucha (about a gallon per week) and I’ve enjoyed the process along the way. I began doing this to avoid the $2.34 per liter cost of kombucha when buying in bulk at costco. Now my cost is about 50 cents per gallon (for sugar and tea). I first tried ordering a scoby online but it was too hot here in September (in Phoenix, AZ) and I think it died in the mailbox on a 118 degree day. Then I found someone nearby on craigslist who I could buy a live scoby from. I actually had to buy a scoby twice because the first time I was trying to use raw sugar and the molasses contained in it caused the kombucha to smell like puke, especially after a few weeks. Since then I’ve been strictly using white sugar and haven’t had trouble. Take the scoby out into the bowl from one of the gallon jars of kombucha, and peel off any old layers of scoby. I used to throw this away, though I had thought of making a foot scrub as described in Kombucha Revolution. But this time I fed the extra scoby to my worms. Add about half a quart of kombucha back in before gently placing a scoby on top. Cover the lid with a dry paper towel secured by a rubber band. This allows the kombucha to breathe while keeping flies (and kids) out. The small jars contain kombucha which is becoming carbonated in the second phase of the process. I usually leave them on the counter a day or two before putting 1-2 jars in the fridge at a time. I like mine cold, but you could drink it without refrigeration. Harvested Kombucha in the quart jars and extra scoby in the bowl to feed my worms. You can open it up and stick a straw in it to taste it every couple days to tell when it’s done, but I noticed that it always tasted sweeter after being in the fridge so I stopped doing that and just try to keep to a schedule (+/- a day or two). 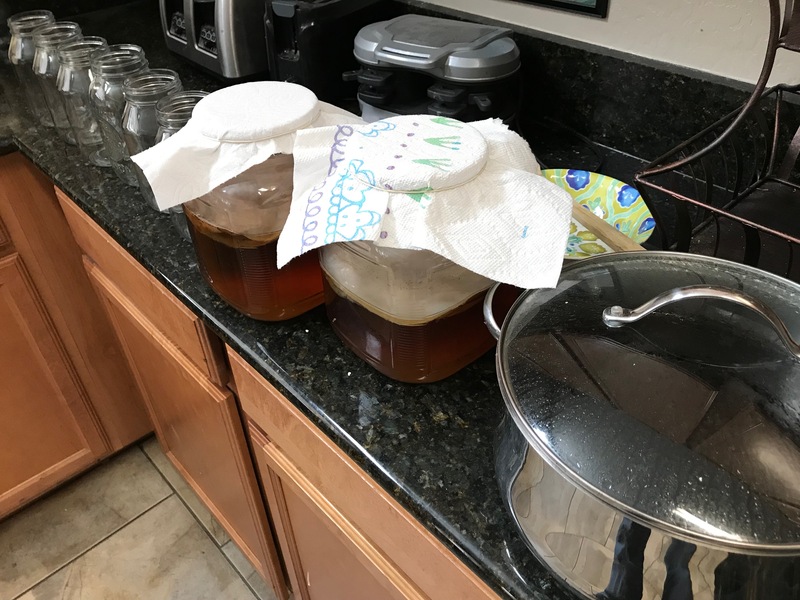 When you procure a scoby from craigslist or from amazon, the first batch will be smaller based on the size of the scoby and how much kombucha starter you get. 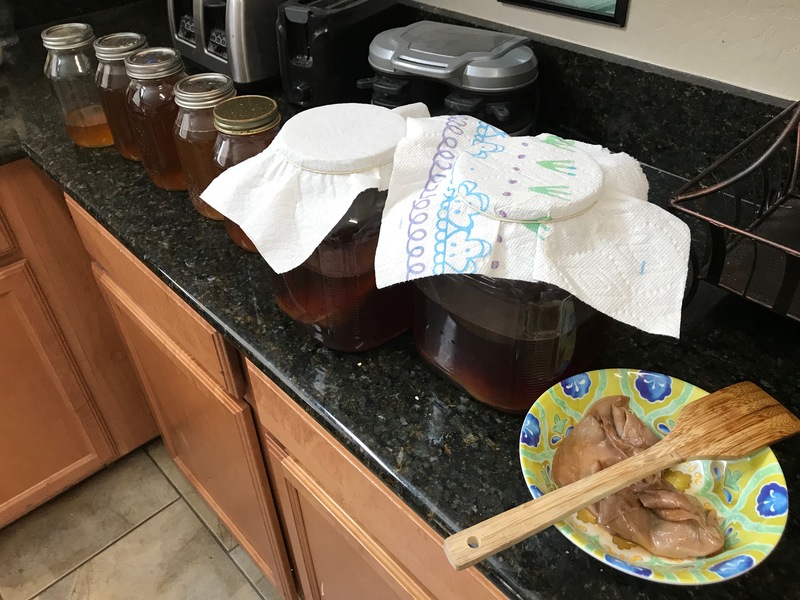 But a healthy scoby can double in size over a week or two depending on the temperature (In the summer it grows faster than the winter at my house). I learned about a great way to find relief from sinus allergies recently. It started with home delivery of local organic produce from Natures Garden Delivered here in Arizona, which gave me easy access to a much wider variety of fruits and vegetables than I even knew existed. One day I was looking through the list of items I could exchange in my box the next week and I saw beets. This reminded me of the beet kvass I made years ago when we lived in Portland and had raw milk delivered to our cohousing community. One a side note, I think red beets are better suited for making beet kvass than either chioggia beets (which I call zebra beets because of the stripes inside) or golden beets. I’ve tried all 3 kinds, the chioggia beets make a light pink color kvass and the golden beets make a pale yellow kvass. We’d been getting raw milk for several months from saveyourdairy.com, a local organic dairy farm in the Phoenix area (visit realmilk.com to help you find a source local to you). One week we didn’t use as much so there was leftover milk, so I decided to make whey by taking some raw milk out of the fridge and letting it sit in a jar on the counter for a couple days until it separated into curds and whey, then pouring it through a cheesecloth to separate the curds from the whey. Then I think I ate the curds and put the whey back in the fridge. More details and instructions for producing whey are on page 87 of Nourishing Traditions. Once I had whey ready in a jar back in the fridge, I then added locally grown organic beets to my next delivery of the organic produce box using the user friendly order customization interface (at az.naturesgardendelivered.com). When I first started doing this in January I drank about a gallon or two per week of beet kvass so I could keep ordering beets every week in my produce box (and because it felt so good to have relief from post nasal drip). I ended up getting a urinary tract infection and passing 4 kidney stones one day because I had effectively replaced my water intake with beet kvass for several weeks. The following tonics are offered for their medicinal rather than epicurean qualities. They are useful for fasting and detoxification. Caution: Fasting should only be undertaken under a doctor’s supervision. Consult a qualified health practitioner for the treatment of all serious disease conditions. I had gotten carried away and drank the tonic like it was water, which is why I got into trouble. So I took a month or two off from drinking beet kvass before making a new batch, which I only do once every other month or so now. I am careful to stick to a small cup of it per day (when I’m most congested) and drink plenty of water throughout the day now. Last night I had some after dinner because we had pizza. This is a great way to help resolve post nasal drip when I’m not experiencing other sinus issues. I’ve written other articles about how I reduce nasal congestion and deal with sinus infections. This post has moved to http://www.lifetimegymnast.com/my-after-workout-drink – please go there for gymnastics updates. I already had half a banana left from one of my children on the counter so I put it in a little bowl, cut it up with a butter knife and fork, used a spoon to put in a little bit of ghee, used the knife to add a little bit of honey (the honey we use has never been heated so it is semi-solid), and added one shake of ginger powder. Then I mixed everything up and gave a spoonful to my son. Although it tasted sweet to me he was in a sad mood and said he didn’t like it, but after one bite he didn’t have any more hiccups! He hasn’t had any hiccups since then, but I won’t forget this remedy – it brought us great relief, since hiccups at bedtime can keep everyone up late. This time I didn’t have any leftover bananas and Kayin said he was hungry so I used one whole banana, broke it into pieces, then added half a spoonful of ghee, half a spoonful of honey, and a few shakes of ginger powder. After mixing it up I gave it to Kayin. He liked it and dug in, but halfway through he stopped and said he was done eating and done with hiccups, and proceeded to go lay down and go to sleep. I got to eat the rest, it was Yummy!